They may seem insignificant to young students, but articles—and the proper use of them—are essential to learning how to write sentences. 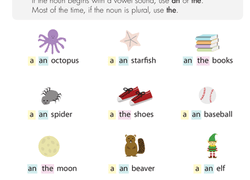 Our grammar articles worksheets reinforce the difference between “a” and “an,” while a word hunt activity helps kids learn how to identify articles amid a group of words. 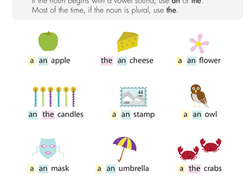 After mastering the art of articles, kids can climb up the next rung of the grammatical ladder with our complete sentences vs fragments worksheets.